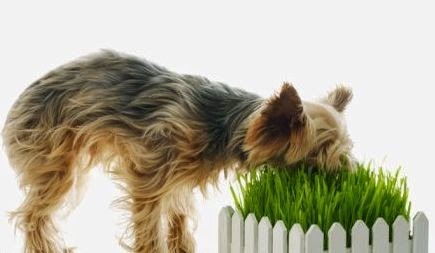 Dogs eat grass because it helps them in their digestion. Some people think that dogs only eat grass when they are sick. It is not true. If a dog lives in a yard, he will probably eat grass after each meal. Moreover, the majority of them will vomit the grass after 10-15 minutes. Don’t you like a salad with your steak? No matter what the dog eats, the grass is helpful. Sure, there are apartment dogs that don’t eat grass, and they don’t feel like eating it. You will not have to pick up fresh grass every morning for the dog, but you should know that taking the dog out in the park after eating is a good idea.